Getting into a routine is easier said than done, so the following 5 habits can assist you to ‘get on track’ with your goals and stay on track. Whether your goals are career driven or related to your health and personal life, it’s all about adapting your lifestyle and daily practices. 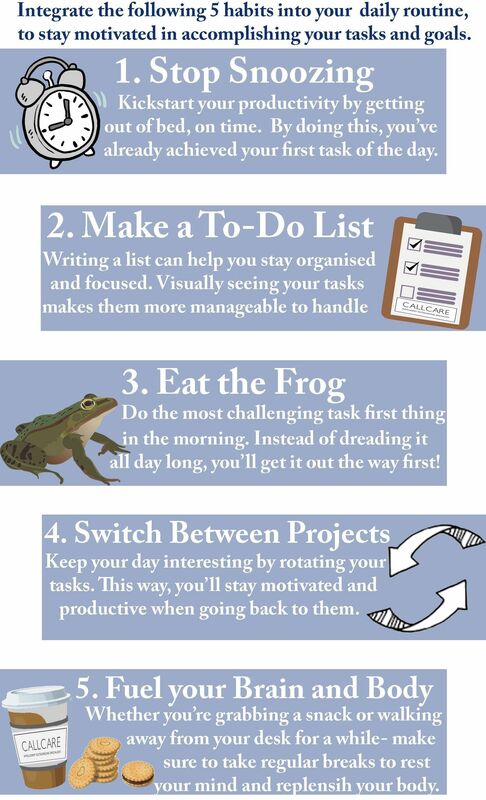 I’ve tried to ‘hack’ the productivity cycle into 5 key habits that I’ve listed below. These habits shouldn’t be something you do, but a new lifestyle that you embody. Don’t be looking for a quick fix to boost your productivity, as it’s a long-term process that will shift your habits and mindset. In the same way that crash diets don’t work in the long run, neither will an ‘overnight’ solution. Your mental habits can quite literally define how successfully you execute your business plans and personal goals. Remember, it doesn’t matter if you stumble every now and then. Not following your new habits for a day, won’t completely ruin your progress if you stick to them for the days that follow. Whilst we’re at it- make a habit out of not breaking your habits after one bad day.